With so many places taking part as partners ranging from the Museum of Contemporary Art Chicago, Art Institute of Chicago, The Block Museum of Art and the Elmhurst Art Museum to the American Writers Museum, Chicago Artists Coalition, Chicago Cultural Center, the Richard H. Driehouse Museum, the Dusable Museum of African American History and Peninsuala Chicago,(to name just a few) about the only way to fit in all the terrific art and events is to plan ahead. So take a look at what is being offered when. 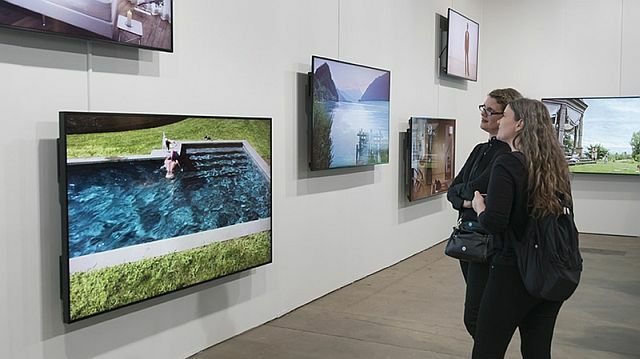 Held Sept. 27-30, 2018 at Navy Pier’s Festival Hall, Art Expo visitors get to can see works that are making statements in 135 galleries from 63 cities around the globe. For hours and tickets visit tickets. For a special viewing opening night, Sept. 27, that includes cocktails and benefits a fine Chicago institution see Vernissage. 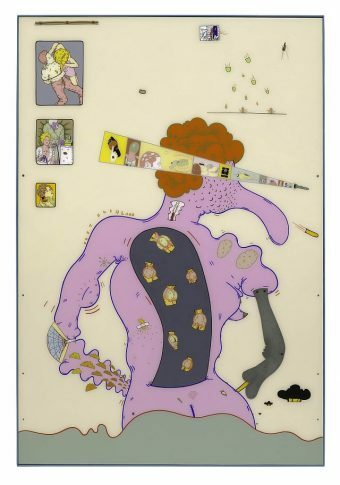 While at Expo, look for the large sculptures and hanging works of the In Situ artists including Judy Chicago’s “Cartoon for The Fall from the Holocaust Projgect 1987″ from the Jessica Silverman Gallery of San Francisco and NY. Try also to take in one of Expo’s informative treats, Dialogues – Symposium on Sept. 28. It is a day-long progam that has a variety of informative discussions with artists, curators, and other art professionals. Dialogues partners include theArt Institute of Chicago, Art Design Chicago and Terra Foundation for American Art..
To learn about other fine exhibits and programs by partnering organization and museums visit art week. One place you don’t go inside but will see if you are near the Merchandise Mart after dark is “Art on the Mart” Sept. 29. Look for an artistic light show on the front of the Mart starting at 6:30 p.m. Wacker Drive will be closed to traffic between Wells and Franklin Streets because of the projections, a Lantern Procession by Light Up My Arts, food trucks and a DJ. Art Expo weekend is the last chance to see “John Singer Sargent and Chicago’s Gilded Age” which closes Sept. 30. It surprises viewers with the depth of art styles used by Sargent who is best known for his portraits. But this week is also the opening of “Hairy Who,” another surprising exhibit. The name is attached to a group of six influential Chicago artists known for their unconventional, graphic works. “Enrico David: Gradations of Slow Release” opens at the MCA Chicago Sept. 29 of Expo weekend. Within an easy bus ride from Navy Pier, the show introduces viewers to this Italian-born artist who currently resides in London and has works in such renown institutions as the Tate Modern and Hirshhorn Museum. The MCA show is the first United States exhibition of Enrico David’s work.